The flagship library of the Seattle Public Library System, Seattle’s Central Library first opened its doors in 2004. 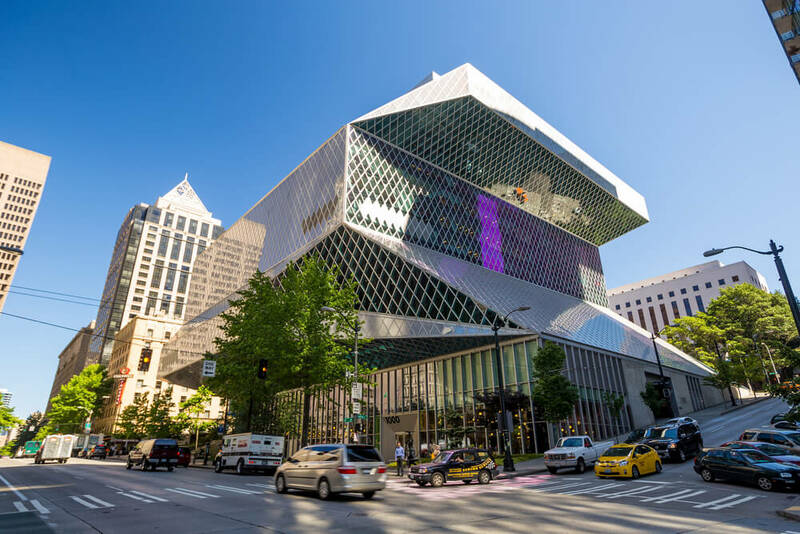 Featuring innovative glass and steel architecture, as well as millions of books and other materials, this is a great spot to visit if you are visiting Seattle for the first time. The architectural design of the Central Library is quite unique, as it consists of several floating platforms that look as though they have been wrapped in a large steel net. However, the innovative design is not just limited to the building’s external facade, as its interior also features a number of interesting details. One of these is the Books Spiral, which twists its way up four stories, over a series of continuous shelves, enabling non-fiction books to be displayed in a way that does not break up their classification system. Other one-of-a-kind features includes the library’s beautifully designed Living Room, as well as its automatic book sorting system. While it is possible to arrange a guided tour of Central Library, a self-guided tour enables you to control the pace, order and content of your tour, meaning that you can easily tailor it to suit your own personal interests. Cell phone tours are available, which require you to enter numbers into your phone at designated areas, after which you will be able to hear the information about that spot. Alternatively, you can also download the Central Library podcast on to your phone, as this features an audio tour that will lead you through all of the library’s highlights. Central Library regularly hosts special events that are free for the public to attend, and these cover such a wide range of topics. From discussions on how Seattle can increase the amount of public space it has to readings by selected authors, do take a look at their website for the full schedule if you are interested in attending some events. The Central Library has long since tried to cultivate visual arts, and there are several pieces of public art on display within the building. These pieces were designed and created exclusively for the site at which they are in, with the artists having been selected after a nationwide search. From the tactile, carved words in the hardwood floor of the Evelyn W. Foster Learning Center, which were created by internationally recognized conceptual artist Ann Hamilton, to the electronic installation that sits above the reference desk in the Charles Simonyi Mixing Chamber, you will no doubt see fascinating art dotted all over the library as you tour it. Seattle’s Central Public Library is home to a wonderfully innovative gift shop, which can be found on level three. In addition to all of the books that are available to be purchased here, you will also find several custom items that have been designed and produced exclusively for the library, from artwork and crafts to cards and games. 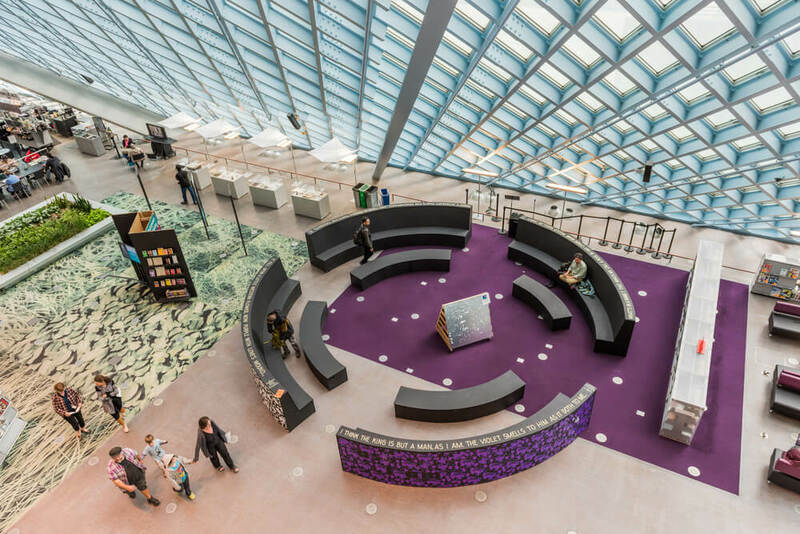 Seattle’s Central Library welcomes over two million visitors each year, with around 30% of them being from outside of the city. This just goes to show how excitingly innovative the city’s Central Library is, as it has become one of the go-to spots for tourists visiting the city.